Kirk Bell January 14, 2019 Comment Now! 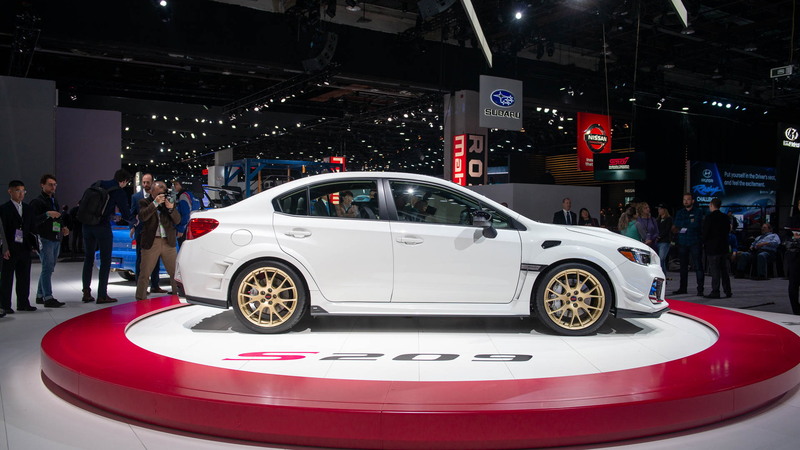 At the 2019 North American International Auto Show in Detroit, Subaru finally gave the STI a shot of adrenaline with the debut of the limited-edition STI S209. 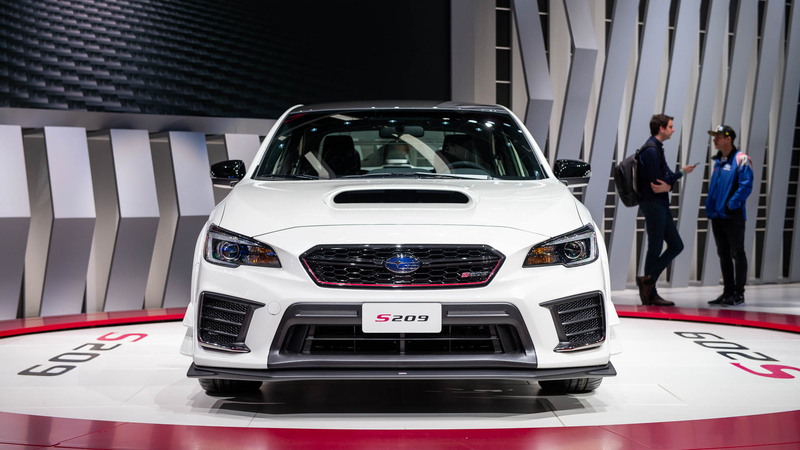 Subaru's STI performance arm breathes on the turbocharged 2.5-liter boxer 4-cylinder to increase output to an estimated 341 hp. 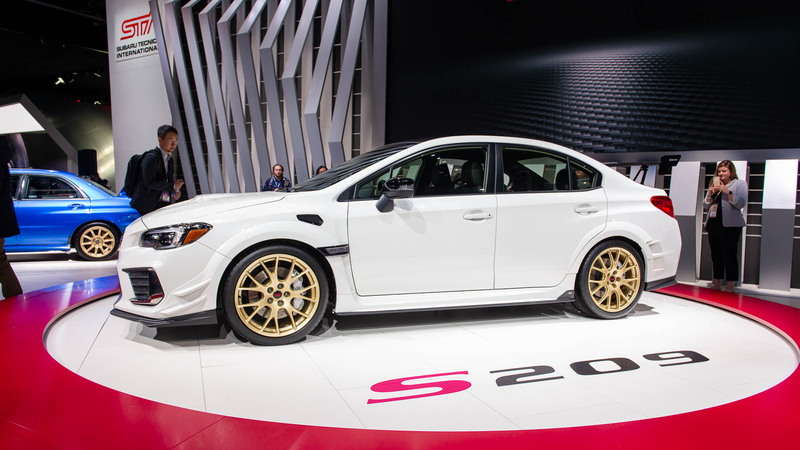 It marks the first time the U.S. market gets an STI-built special model. Until now, only Japan received the S201-S208. In addition to the power, the S209 features handling and aerodynamic upgrades aimed at improving driver engagement and turning the car into an unapologetic track machine. In fact, technology trickles down from the WRX STI Nürburgring Challenge race car. To make that extra power, the EJ25 boxer-4 gets a larger turbo and compressor to make 18.0 psi of boost instead of 16.2 in the stock STI. It also features lighter and stronger forged pistons and connecting rods, a high-flow air intake system, a high-flow fuel pump, larger fuel injectors, a reprogrammed ECU, and an exhaust system with 17-percent less airflow resistance and polished stainless steel tips. In a nod to the 2004-1007 STI, Subaru also outfits the car with an intercooler water spray system controlled via steering wheel paddles that drivers can use to lower the intercooler temperature. Subaru says mid-range power is up 10 percent but doesn't supply a torque figure. The only transmission is Subaru's close-ratio 6-speed automatic. For track-ready handling, Subaru widens the front and rear track by 0.6 inch, stiffens the structure, and upgrades the suspension. The front crossmember and rear subframe are reinforced, and the S209 gets a flexible front strut-tower bar and flexible front/rear draw stiffeners. The flexible front bar adds lateral stiffness while allowing for a compliant ride. The draw stiffeners apply tension between the body and cross member to counteract body flex in turns; Subaru says they improve ride, handling, and steering response. The suspension upgrades consist of Bilstein dampers, stiffer coil springs, a 20-mm rear stabilizer bar, and new bushings for the front and rear lateral links. Grip is improved thanks to specially developed 265/35R19 (versus the narrower standard 245s) Dunlop GT600A summer tires on 9-inch-wide forged BBS alloy wheels. Underneath those wheels, Subaru installs Brembo brakes with cross-drilled rotors, 6-piston front calipers, 2-piston rear calipers, and upgraded high-friction pads. The S209's body is 1.7 inches wider to accommodate the wider track and wider tires. It has front-fender vents for engine cooling, rear-fender vents to reduce drag, and aerodynamics from the Nürburgring race car, namely, canards on the front bumper, a carbon-fiber roof, a big rear wing, and front, rear, and side under spoilers. S209 badges are applied to the grille, fenders, and decklid. 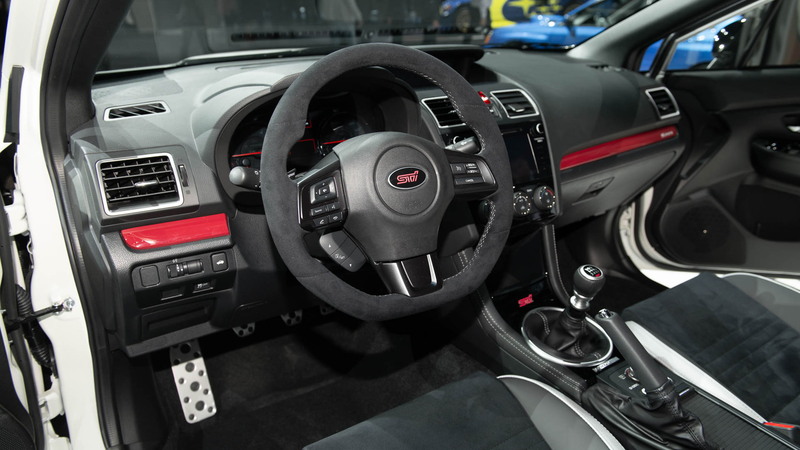 Inside, the STI S209 adds an STI badge on the flat-bottom steering wheel in place of the Subaru logo, an S209 serial number badge on the center console, and S209 badges on the front seats and dash. The steering wheel and center console are wrapped in synthetic suede with silver stitching, while the Recaro front buckets get silver inserts. 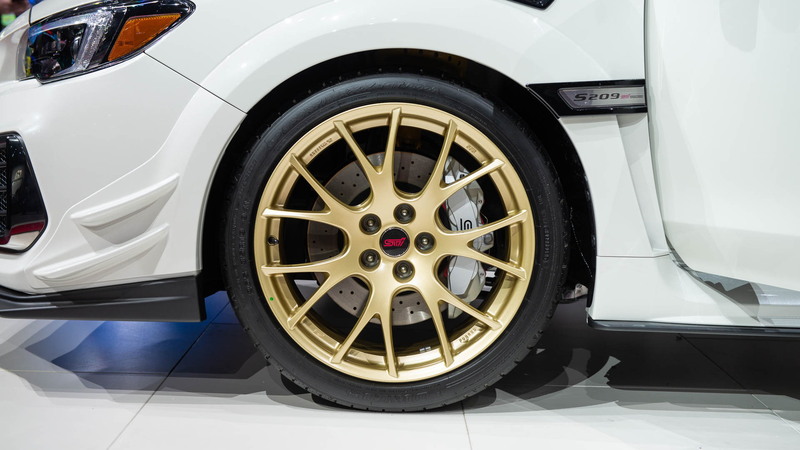 Only "around" 200 STI S209 models will be offered and buyers will have a choice of WR Blue Pearl with gray wheels or Crystal White Pearl with gold wheels. The price hasn't been announced, but it will certainly be higher than the $48,995 of the 2018 Subaru WRX STI Type RA.